In June 1995, the Cardinals were a franchise in disarray. The depth of their dysfunction was revealed on one dismal day, June 16, when they fired their manager, Joe Torre, and traded their cleanup hitter, Todd Zeile. Rather than signal an inspiring beginning, the moves had the feel of surrender. The termination of Torre largely was viewed as a lame effort to deflect attention from management’s shortcomings. The trading of Zeile largely was viewed as spiteful. After being named Cardinals manager in August 1990, Torre led the Cardinals to winning seasons each year from 1991 through 1993. His best record was 87-75 in 1993. When the Cardinals fell to 53-61 in strike-shortened 1994, Torre’s friend, general manager Dal Maxvill, was fired and replaced by Walt Jocketty. By then, the Anheuser-Busch ownership of the Cardinals seemed more interested in minimizing expense to enhance profitability than it did in investing in the team. After splitting their first 18 games, the 1995 Cardinals lost 10 of their next 13 and sunk to 12-19. Published reports indicated Cardinals president Mark Lamping was pressuring a reluctant Jocketty to appease a restless fan base by changing managers. On the morning of June 16, with the Cardinals’ record at 20-27, Jocketty went to Torre’s home and informed the manager he was fired. “It didn’t surprise me,” Torre told Rick Hummel of the St. Louis Post-Dispatch. His overall record as Cardinals manager: 351-354. After considering Cardinals coaches Chris Chambliss and Gaylen Pitts as candidates to replace Torre, Jocketty chose director of player development Mike Jorgensen. “He is an intense guy … He’ll bring a little fire to the clubhouse as well as to the field,” Cardinals pitcher Tom Urbani said of Jorgensen. Jocketty, though, wasn’t done for the day. Next, he dealt Zeile. 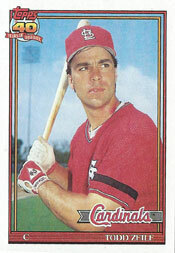 Zeile was batting .291 with five home runs and 22 RBI as the first baseman and cleanup hitter for the 1995 Cardinals. In June that year, he revealed the Cardinals had reneged on a three-year, $12 million handshake agreement he said they made in April. Lamping was furious. “There never was a deal with Todd Zeile,” Lamping said to Hummel. Jocketty traded Zeile, 29, to the Cubs for pitcher Mike Morgan, 35, and a pair of minor-league players, first baseman Paul Torres and catcher Francisco Morales. “We’re not happy with the chemistry and the focus of this team,” Jocketty said. “If you saw Todd Zeile play, you could see he’s not a real aggressive person in his approach to the game. He was kind of at one gait. In seven seasons with St. Louis, Zeile started at three positions _ catcher, third base and first base _ and batted .267 with 75 home runs. Getting fired by the Cardinals turned out to be a blessing for Torre. He was hired to manage the Yankees and led them to four World Series titles and six American League pennants. Torre was inducted into the National Baseball Hall of Fame in 2014. Jorgensen managed the Cardinals to a 42-54 record and returned to the front office after the season. He was replaced as manager by Tony La Russa, who would lead St. Louis to two World Series championships and three National League pennants and would be inducted into the Hall of Fame with Torre. Rookie John Mabry replaced Zeile as the Cardinals’ first baseman. Zeile was a bust with the 1995 Cubs, hitting .227. After leaving the Cardinals, Zeile played for 10 teams: Cubs, Phillies, Orioles, Dodgers, Marlins, Rangers, Mets, Rockies, Yankees and Expos. He had 2,004 hits and 1,110 RBI in 16 seasons in the majors. Morgan made 17 starts for the 1995 Cardinals and was 5-6 with a 3.88 ERA. The next year, he was 4-8 with a 5.24 ERA for St. Louis before he was released. The two minor-league players acquired with Morgan from the Cubs never reached the big leagues. Firing a class act like Joe Torre was a disgrace. It’s become sort of an obsession to gripe and complain about the way the Cardinals FO has run the team for the past couple of years, but when I think back to the first half of the 90’s… I realize that things aren’t really that bad. In the end, Todd put up some very respectable numbers.I didn’t know he had done that well. Yes, quite a nice career. Thanks for reading and for commenting. This was excellent insight regarding a tough time in St. Louis. There is a lot between the lines of your story. Thank you so much! Intriguing times.